The Spring ritual remains the same. We open up the sun porch, uncover the furniture, put potting soil in the planters and check the gas grill. But this year held a surprise. Our beloved grill was no more. It died over the winter, and immediately we felt the void in our lives. Each time my poor husband went out to the patio, he would emit a devastated sigh. I could see his heart was broken. You know, until this point, I didn’t realize the bond which existed between this man and his gas grill. To me it’s an appliance; to him it’s a friend. And apparently, he isn’t alone in this assessment. We went to one of the big home improvement stores., and we couldn’t see the gas grills, because a wall of men — about 40-men deep — surrounded them. We pushed ourselves forward to get a better view, and when we reached the front of the line, I heard my husband gasp. 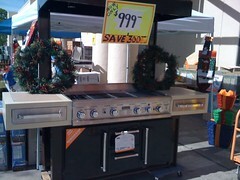 For there, standing in front of us, was the mother of all gas grills. I saw my husband’s face, and then I looked around at the other men. Everyone of them wore the same look of amazement and wonder. Yes, this grill had captured the attention of every male in that store. It had cast a spell and drew them all in. Frankly, as a woman, I was confused. I never drool over kitchen appliances this way. I view them as necessary evils. I have no desire to become attached to them. And I never see men drool over these appliances either. How come a man has trouble operating the stove in a kitchen, but put it outside and stick a propane tank under it, and he turns into Wolfgang Puck? So, here we were paying homage to this grill. I’ll admit, it was impressive — or at least massive. It was composed of three sections. The two end pieces were made of stainless steel and had burners and a mini-refrigerator attached to it while the center area had a stone foundation. This outdoor grill was more sophisticated than the real kitchen inside our house. Also attached to the grill were a cutting board, a rotisserie attachment and a spare propane tank. This baby also wore a price tag of $1,200. When my husband lifted the lid of the grill, he drooled over the four levels of racks that sprung up and sparkled like chrome on a new car. “Okay, I love you from the bottom of my heart and soul, but there is no way in this lifetime you are spending that kind of money on a barbecue!” I said calmly. “But, it would really come in handy when we have guests,” he retorted. “How many guests are you talking about? One? Two? The entire county?” I asked facetiously. Now in agreement on what we wanted, we walked around looking at the other models. And there in the corner stood a nice, little, unpretentious grill. It stood there alone. No one crowded around it. My heart went out to it. It looked as if it needed a home and someone to care for it. None of the men in the store seemed to want it. It had no super duper grilling rack. It had no side burners or rotisserie. It wasn’t even stainless steel. But what it did have was a price tag of 150 bucks. Now, I was in love. It was then I saw the light bulb click on over his head. The assembly — that was the key. He forgot about the assembly. He hates putting gas grills together. I agreed for I know he’s hoping that somewhere in some store is his dream grill, already assembled and selling for no more than $300. I’ll let him dream on for a while. He deserves it because as we all know, the relationship between a man and his barbecue is sacred. Got the book, read the story, laughed again. Happy Memorial Day weekend. HA HA Thanks Fran. It’s amazing that so many did not get the book. LOL This was one of my favorite posts ever to be honest, so I thought it fitting for Memorial Day. I never understood the side burner. I have one and I have never used it. Extra work to create vegetables to displace meat? No thanks. Lots of side dishes you can warm up. I love the side burner and use it all the time. Eric, are you just a carnivore? Do you know what a vegetable looks like. Besides that, I don’t use the side burner or rather my husband does not. He prefers a beer bottle holder. And as big as that smile was on his face, mine was just as big not halfway through this story. Why? Because as a man I know just how he, and those other men, were feeling. I have to ask my wife how to simply turn the dishwasher on, but put me in front of a gas grill, and I become an instant expert. Like a lawn tractor or a car, there’s an inexplicable bond between a man and his grill. But don’t blame your husband. He can’t help it. It’s in his genes.